You may need to prepare a bath chair in your house for the old people. With the chair, the old could be largely protected from any potential danger while bathing. It is made with premium plastic, rubber and aluminum alloy, of guaranteed durability and strength. And it features anti-slipping design, quite suitable for bathroom use. How about giving it a try? SECURE, & RELAX - FDA cleared, the highest standard in medical shower stool; Tool-Free. Shower chair allows individuals i.e. anyone or seniors or those with limited mobility or injury to sit during shower. Create a relaxing shower experience; allows fall risk individuals to shower independently. DURABLE & ANTI-SKID, NON-SLIP - NEW model shower chair is now made with heavy-duty anodized aluminum frame with a weight capacity of 315lbs. Aluminum frame is lightweight, durable and corrosion proof. 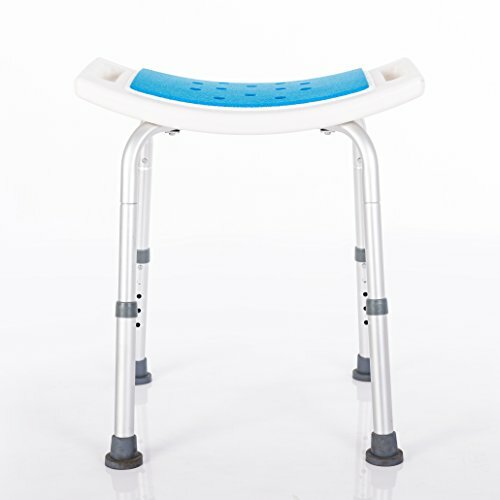 Its unique angled legs with non-skid rubber tips allow users' weight to be distributed over a larger area making the shower chair ultra-safe and stable. COMFORTABLE: WIDE SEAT WITH SMALL DRAINAGE HOLES - NEW design brings increased comfort with a wide (20.1"W x 12.75"D) contoured, high-density, anti-bacterial polyethylene seat. Unique drainage holes on the seat allow water to be drained effectively thereby reducing the risk of slippage. Ultra-small drainage holes also improve the overall seating experience and reduce slip-through items. LIGHTWEIGHT & PORTABLE - Weighs 5 lbs. Comes with built-in side handles to easily lift or move the chair. If you have any questions about this product by Ke's Haus, contact us by completing and submitting the form below. If you are looking for a specif part number, please include it with your message.